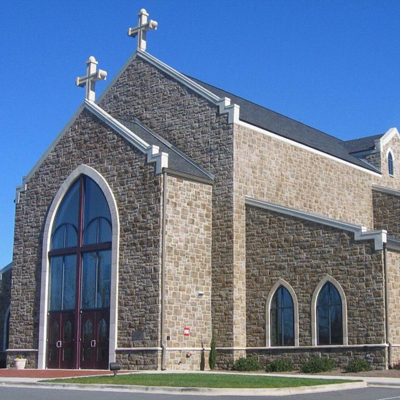 An exterior view of St. James the Greater Church in Concord, N.C.
On April 4 St. James the Greater Parish in Concord, N.C., celebrated the dedication of its new Our Lady of Guadalupe Hall. Having seen a 40 percent increase in parishioners in the past three years, the community badly needed more space for faith formation, youth and young-adult programs, Bible studies, and other needs. Bishop Peter Jugis of Charlotte led the dedication ceremony and blessed the hall. About 40 percent of the 22,500-square-foot building is ready for use. The rest of the space will be rented as a source of parish income. Before the ceremony, pastor Father Jerome Chavarria, C.Ss.R., said, “We are ‘immigrants’ from everywhere­—New York to Massachusetts, Colombia to Mexico, Ohio to Tennessee, Florida to Texas, and everywhere in between,” according to an article published April 5 in the Catholic News Herald, diocesan newspaper for the Diocese of Charlotte, N.C. The former pastor, Father Joseph Dionne, C.Ss.R., came from Our Lady of Guadalupe Parish in Newton Grove, N.C., to be present. This 22,500-square foot building has now been renovated and on April 4 was dedicated as Our Lady of Guadalupe Hall. The parish will use a portion of the building and rent the rest.